The role of milk flow and take-off level in milk quality – What does somatic cell count really tell us? – What do dairy farmers with low bulk tank somatic cell counts have in common? Managing mastitis in heifers - Using DHIA Records for Somatic Cell Count Management - Raw Milk: Risk or Reward? 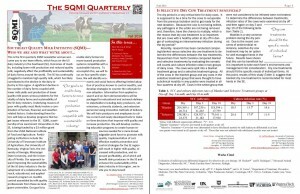 Fall 2014 Issue: Who We Are & What We're About - 5 Common Parlor Mistakes You Should Avoid to keep Somatic Cell Counts Low - Extended Therapy for Mastitis - Is Selective Dry Cow Treatment Beneficial?